Ricky Nelder gears up for his bout with Eric Olsen on January 27th. 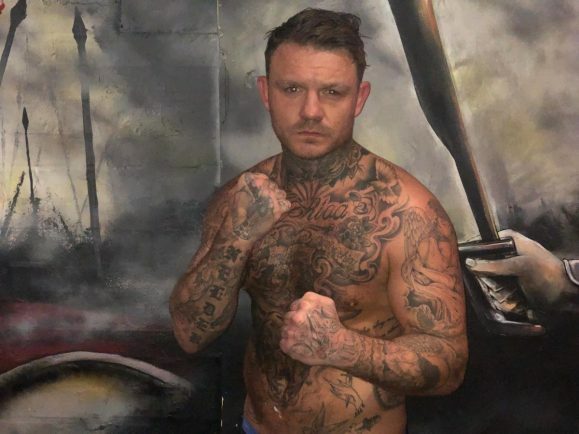 BAREKNUCKLE Boxer Ricky Nelder is back fit and fighting after recovering from a broken neck, and he is ready to launch a potential bid for the world super-middleweight championship after his bout this month against Eric Olsen at London’s O2 Arena. Despite suffering such a potentially serious injury, he wasn’t exactly sure what caused it in the first place, seemingly not noticing it until driving in his car one day. “I guessed something was wrong. I had a neck pain for a few weeks and took a few pain killers to deal with it. Not realising the full extent of his injury, Nelder was forced to have a spinal operation and a metal cage fitted onto his neck, being told to rest up for six months to ensure full rehabilitation. But undeterred, four months later he was back up and running the Milton Keynes marathon, his fighting spirit clearly translating into speeding up his recovery. The 33-year old now looks forward to his first fight back on Saturday, January 26th, where he is the current odds-on favourite to get back to winning ways. His last fight in September 2017 saw him beaten in a title challenge with Goran Reljic in September 2017 prior to his set-back, which he still looks back on as a motivating factor to rebuild his career in bareknuckle boxing. “I can’t quit this sport until I’ve won the world title. No matter how long it takes, I’m going to get my hands on that world title. Nelder’s style as a rugged, forward fighter with a stern left-hook has made him a fans’ favourite and admits he has never been concerned by the brutal nature of the sport. “I prefer scrapping to boxing,” he said. “I don’t care about taking three punches to land one. Some people worry about pain and blood. They wince when they are about to take a punch. “But it doesn’t bother me. I can walk through punches. I’ve got a style that people want to see. The Bromsgrove man explained that it hasn’t always been that way for him, and admittedly fell into the sport after coming back from a night out. “I had been out all night, got home, watched a bit of YouTube and stumbled across bareknuckle boxing, when I started messaging the fighters saying I wanted to get involved. “The next day, I woke up and I had messages from some of the fighters.